According to OSHA regulations, forklift inspections should be conducted on a daily basis at the start of the operator’s shift. It is the operator’s responsibility to fully inspect the forklift before it is placed into service and report any abnormalities to their supervisor. Operations that run multiple shifts are required to perform a pre-use inspection at the beginning of every shift. Tires: Ensure the forklift’s tires are in good condition. Check for slashes, cuts and air pressure in pneumatic tires. Hoses, Belts & Chains: Inspect these for excessive wear. Things to look out for are cracks, pinholes or leaks. SAFETY TIP: NEVER place your fingers inside the mast. Fluid Levels: Check hydraulic fluid levels and ensure there are no leaks. Engine / Power Source: Check engine in IC forklifts and check the power source in electric forklifts. Forks, Backrest, Mast, & Overhead Guard: Check each piece for cracks, dents, broken welds or any other irregularities. Data Plate & Labels: Ensure both the data plate and any warning labels are legible. Seat Belt: Check the seat belt is in good condition and fasten it securely. Gauges, Warning Lights, & Fuel Levels: Turn on your forklift and check the gauges, warning light and battery/fuel levels. You should ALWAYS be seated when you turn on a forklift. Do not attempt to start the engine while standing outside the forklift. Safety Equipment: Check any safety equipment such as a safety lights to ensure they’re working properly. Controls: Use the controls to lift/lower the forks and to tilt the mast and check they’re operating smoothly. Horn: Honk to test your horn is working. Remember to always honk at intersections. Brakes: Allow the forklift to move forward and then step on the brake to ensure it’s working smoothly and reliably. Steering: Check the steering. Note that hard steering may reduce your control. Parking Brake: Set and test the parking brake. Don’t forget to put the controls in neutral. At this time, get out of the forklift and check for leaks. Leaks can signal a hydraulic issue. Any fluid left on the floor could also result as a slipping hazard. Exhaust System: Check to see if there are any sparks or flames coming from the exhaust and listen for any unusual sounds. Congratulations! You’ve made it to the end of the forklift pre-use inspection as mandated by OSHA. If you didn’t spot any irregularities, you’re ready to get your shift started. SAFETY NOTE: As always, if you notice any abnormalities during your forklift pre-use inspection, please report your concerns to your supervisor and flag the forklift until you have received clearance. Your safety and the safety of others always comes first. Why is Safety Training Important? Even though forklift operators experience much pressure to perform efficiently, it should never be at the expense of safety. In the U.S alone there are over 1 million operating forklifts in warehouses and various other environments. Meaning, there are countless people besides operators coming in contact with all these forklifts and their security should be a priority. Let’s discuss why safety is so important and what you can do to improve safety in your workplace. Investing upfront in quality training for operators would reduce costly injury-related expenses down the line. Learn how to care for your forklift properly. The better you know your machine, the easier it will be to detect when something is wrong. Routine daily inspections are required by OSHA regulations under the Powered Industrial Truck standard at 1910.178(q)(7). Some of the main checkpoints during inspections include seat belts, tires, lights, horn, brakes, backup alarms, and fluid levels, as well as the moving and load-supporting parts of the forklift. Safety should always be top of mind when operating a forklift. Don’t underestimate the importance of conducting daily inspections and mastering concepts such as the forklift stability triangle. By staying alert and exercising good judgment, incidents of all severity can be avoided. Determining the best-suited forklift fuel type for your application is an important factor in running an efficient and cost-effective operation. We’ll describe 3 fuel types- Diesel, LPG, and Electric- along with the appropriate application for each fuel type and their advantages and disadvantages. With this information, you will be able to determine which fuel type would be most suitable for your workplace and whether your current fuel type is appropriate. Diesel forklifts are most commonly used for heavy lifting, industrial or outdoor applications. The lifting capacity for a diesel forklift ranges from 4,000 lb. to 55,000 lb. Wet or damp environments do not adversely affect the performance of a diesel truck making it a great option for outdoor applications. Electric forklifts are battery operated and most commonly used for indoor or cold storage applications. These forklifts are safe to use in closed food processing environments because there are no fumes emitted. Electric forklifts should never be used outdoors. Exposure to rain or snow can cause a short circuit. 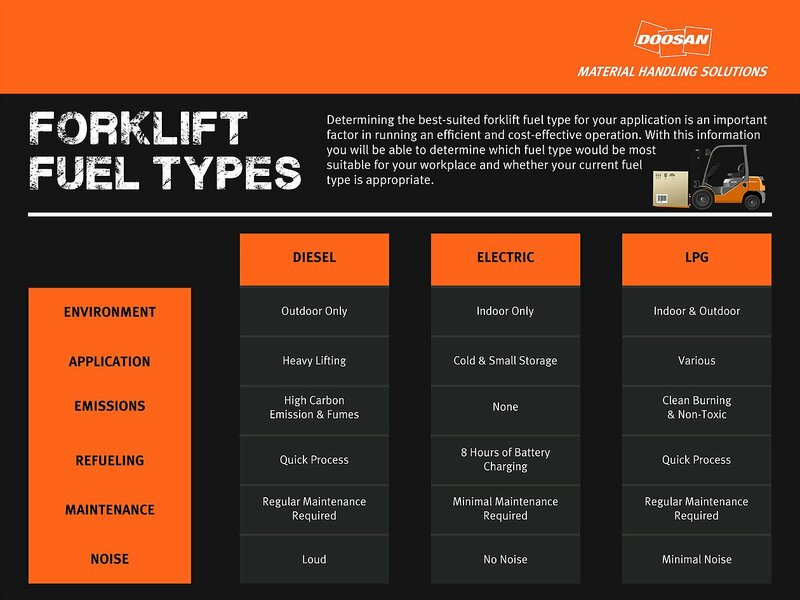 LPG forklifts offer the versatility to be used in various environments. This is the perfect option for a workplace that requires both indoor and outdoor applications. Emissions from LPG forklifts are much lower than their diesel counterparts making it safe to use indoors. No concern for short circuits allow this lift to be used outdoor in wet climates. Now knowing the pros and cons to each fuel type, you have a good foundation for choosing the best-suited fuel type for your application. One of our experts at Doosan Material Handling Solutions can fully assess your workplace, application and other operational needs to provide a tailored forklift solution built to your specifications. Contact us at dmhs.sales@doosan.com or 678-745-2230. If you have found this blog helpful share it on your social channels. Nothing affects your bottom line as profoundly as increased efficiency. Installing side shifters and fork positioners on your forklift will undoubtedly increase productivity allowing your forklift operators to make fewer movements when moving heavy loads. The benefits don’t stop there creating a snowball of savings. With increased productivity, forklift operators complete work in less time. Now that loads are being moved more quickly, fuel consumption is significantly decreased as well. Forklift operators will be substantially pleased with this attachment as it will make their work more comfortable and safer, reducing workplace accidents. So now that you know the benefits and uses, how do you get these attachments installed on your forklift? If in the purchasing stage, “integral installation” can be done directly by the manufacturer. This means that the attachment is added when the truck is being produced, and the rated forklift capacity will not be compromised. However, if you have already purchased your forklift, don’t worry, you can still take advantage of this cost-saving attachment. In this case, Doosan Material Handling Solutions (DMHS) can do an “aftermarket installation.” Since both the side shifter and fork positioners are mounted onto the carriage assembly and powered by hydraulics cylinders attached to the fork tynes, we recommend installing both at the same time. This assures the least amount of capacity being compromised. If you are considering adding these or any attachments to your existing forklift and would like more information, reach out to DMHS. Our parts experts can assist you at any of our 3 metro Atlanta locations in Buford, Austell, and Fayetteville. Other speeches from the morning were given by Gail Edwards, Dean of Automotive, Construction and Trades at Gwinnett Technical College, Trena Harris, General Manager of Human Resources for DIVAC, John Faulkner, President of FMH Material Handling Solutions, Sangchul Kwak, CEO of Doosan Industrial Vehicle, and Hyunsoo Dong, Vice Chairman of Doosan Corporation. 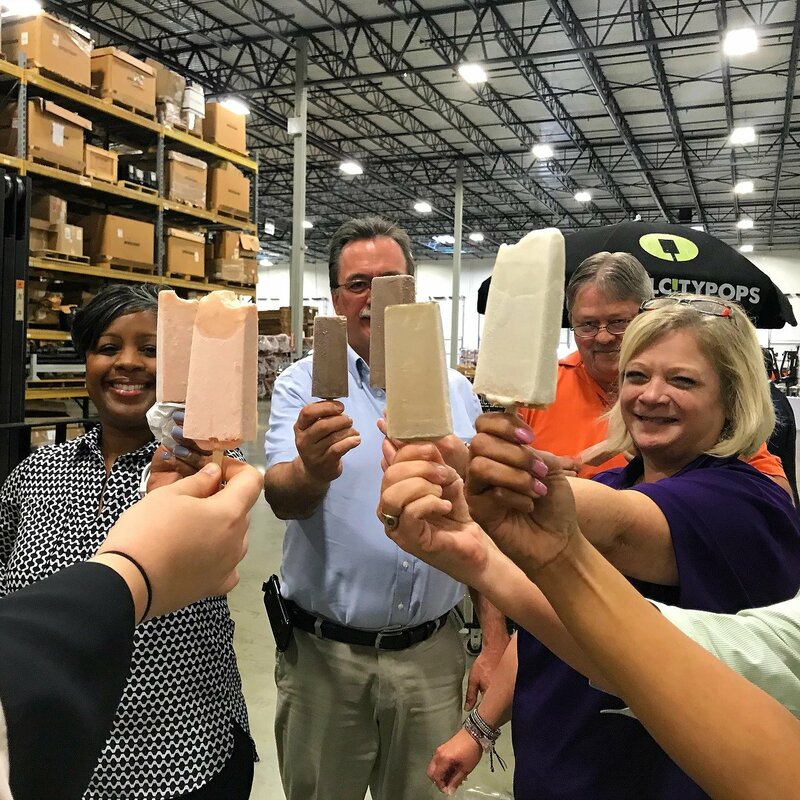 After a spirit-filled town hall meeting, everyone moved to the warehouse for popsicles provided by Steel City Pops Atlanta, where we enjoyed fellowship and networking. It was finally time for the big moment. We walked to the front of the new building where Gwinnett Chamber of Commerce had set up for the ribbon cutting. Tony Jones invited our VIP guests up to the front and thanked all the people who made this day possible. 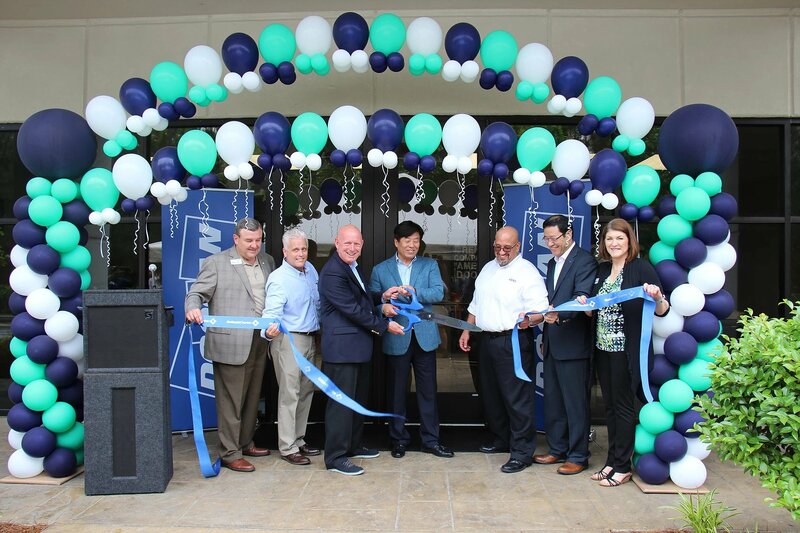 After an inspirational speech about Doosan Material Handling Solutions’ story, Mr. Dong, Vice Chairman of Doosan, Mr. Kwak, CEO of Doosan Industrial Vehicle, Nicholas Garbis, Sales Manager of DMHS, and Dale Darling, Operations Manager of DMHS were invited to cut the ribbon with Mr. Jones, CEO of Doosan Industrial Vehicle America Corporation. 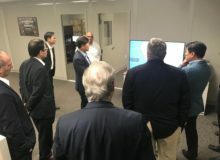 Everyone moved into the new building, where a tour of the facility was conducted, and a video of Atlanta’s market data was shown. 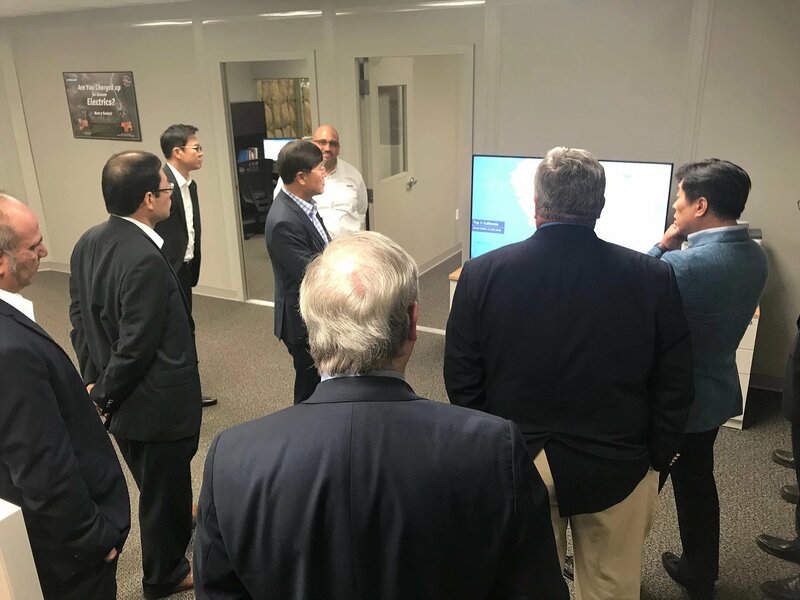 The day concluded with lunch, and a separate tour of Doosan Material Handling Solutions’ second location in Fayetteville, Georgia. 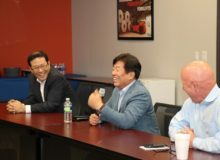 Doosan Material Handling Solutions (DMHS) is unique to Atlanta’s market. 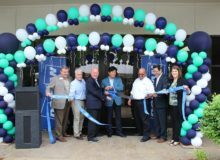 As Doosan’s first corporate retail operation, DMHS is looking forward to providing quality customer service to Atlanta. DMHS is a combination of world-class products, a dedication to customers, and service and parts support backed by factory certified technicians, and the most extensive inventory of parts in the Southeast. We caught up with Nicholas Garbis, Sales Manager of Doosan Material Handling Solutions (DMHS), to talk about what Atlanta can expect from Doosan’s newest retail operation. D: What brought you into the material handling business? NG: I worked in the Electric motors industry on the service side. Before that, I owned a small business. On one hand, I have been a small business owner. On the other hand, I have worked in the corporate world managing teams in warranty and quality. I understand how to start things from scratch and how to excel as a small team within a large organization. I think having these experiences have helped me immensely in the creative process as Dale Darling, the Operations Manager, and I continue to develop the factory store model. D: How many locations does Doosan Material Handling Solutions have? 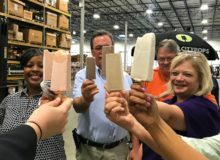 NG: There are three locations, one in the north, here in Buford, GA, one in the south, in Fayetteville, GA, and one in the west, in Austell, GA. These ensure coverage of the entire Atlanta region. Doosan carefully and strategically chose these three locations around the city, so we can better serve our customers with specials unmet by the competition – like a 4-hour response rate and from $49/ PM rates. DMHS embraces “inwha” or “harmony” one of our parent company’s core value. From the parts and service side, we are focused on your forklift operational issues and ensuring quick, professional resolution. From the sales side, we are committed to finding you find the right forklift or pallet truck for your business growth. Our credo is the will earn your business. D: What do you think your greatest asset is that you are bringing to the Atlanta market as DMHS? NG: I think the Atlanta market is starved for fast, professional, and quality service. At DMHS, we view ourselves as a direct extension of Doosan Industrial Vehicle. First, Atlanta is a huge market for forklifts, especially in shipping/distribution and wholesale retail. Secondly, we are headquartered here. This is our neighborhood and we have a vested interest in success. Finally, we have a tremendous amount of product here, ready for Atlanta. D: With Atlanta being in the top ten markets for distributing goods, what message do you want Atlanta to know about DMHS? NG: We are here! 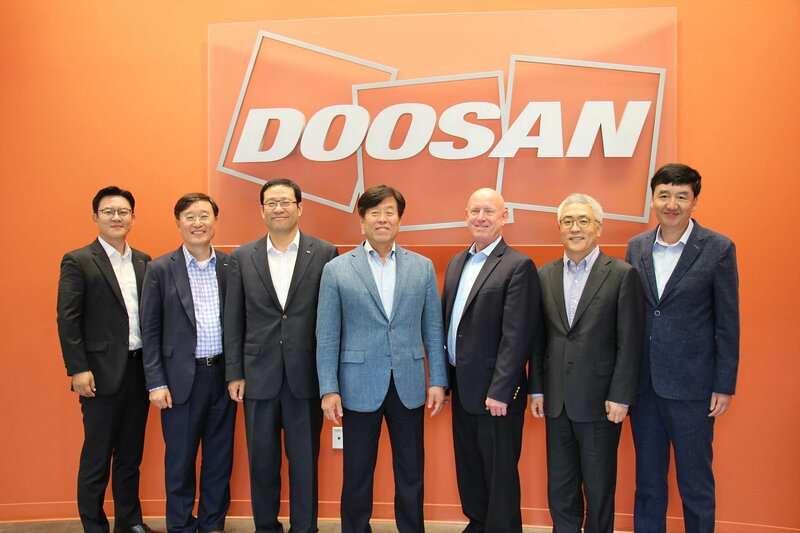 We have been here since 1994, we have a long history of quality product, and we can’t wait to be the customer facing entity of Doosan in Atlanta. Atlanta is clearly the economic hub for the Southeast, meaning there is a copious amount of needs for equipment in this area. The airport alone is one of the most heavily trafficked airports in the world. This is an active region, with people moving to the area and product moving in and out daily. We simply want Atlanta to experience the Doosan difference. We are not a run of the mill dealership, we are different. As a factory store, we have both the resources and products that will allow us to stand out against the competition and really ensure that we can provide the best customer service in the industry. As a start, we are offering unprecedented door buster deals with a commitment to servicing all brands at the lowest rate. We offer new and used equipment, parts, service, and rentals! Don’t take our word for it. Let our actions speak for themselves. We will earn our customers’ business the old-fashioned way – through our actions. Buford, GA: Doosan Material Handling Solutions (DMHS) of Doosan Industrial Vehicle America Corp. (DIVAC) purchased All-Lift of Georgia in Fayetteville, GA this past Friday, March 9, 2018. 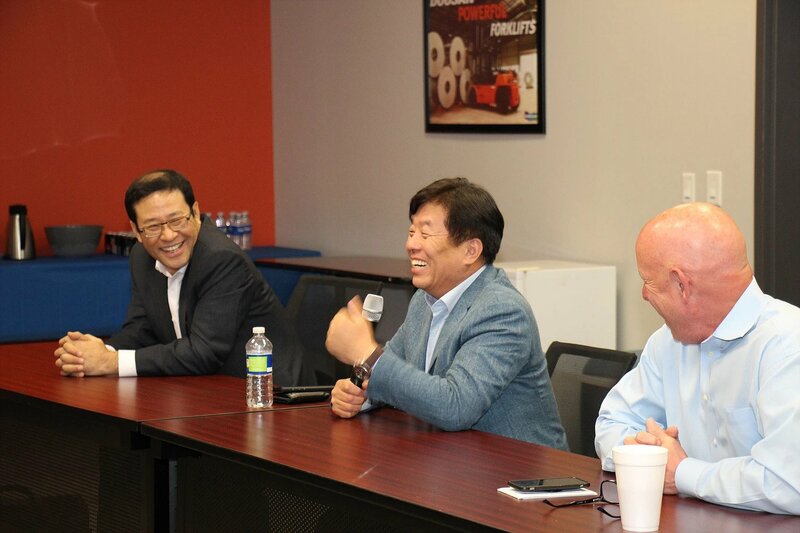 This is the third location of DMHS, including American Forklift in Austell, GA, and the location in the Doosan headquarters in Buford, GA.
Doosan Material Handling Solutions (DMHS) is unique to Atlanta’s market. 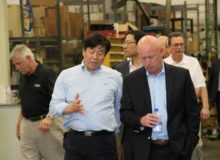 As Doosan’s first corporate retail operation, DMHS is looking forward to providing quality customer service to Atlanta. DMHS is a combination of world-class products, a dedication to customers, and service and parts support backed by factory certified technicians and the largest inventory of parts in the Southeast. Doosan is Korea’s oldest business organization with a proud history spanning more than 120 years. As the world’s leading Infrastructure Support Business (ISB) provider, Doosan delivers the basic necessary for improving the quality of people’s lives. Doosan’s history represents a story of dynamic change and growth. 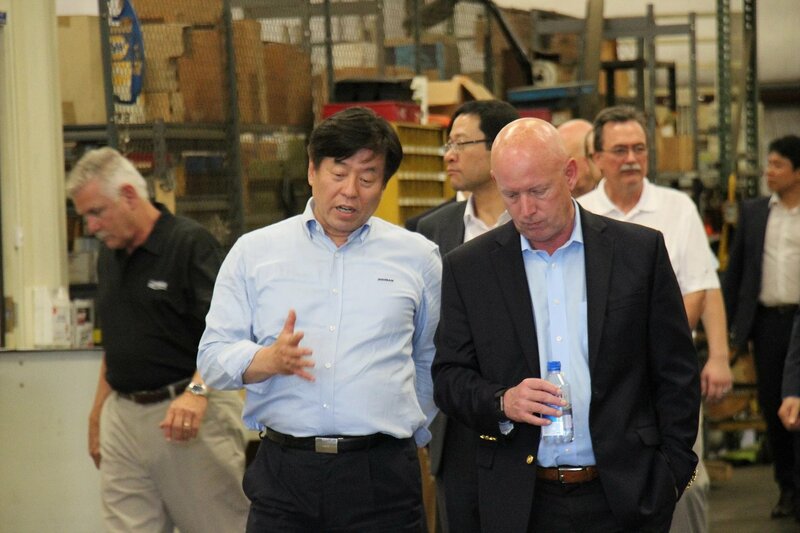 With about 40,000 employees in 38 countries, Doosan now operates 25 affiliates and 121 global entities. Doosan’s presence can be found in every area of the infrastructure support business, which encompasses energy development, industrial facilities, parts and machinery, heavy equipment, construction, civil engineering, transportation and other value-added areas. 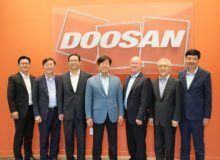 Doosan Industrial Vehicle America Corp. is headquartered in Buford, GA. Copyright 2019 Doosan Material Handling Solutions. All Rights Reserved.Web Design By Sharp Hue.